2018 is a very special year in Tamworth as it marks 1,100 years since the death of one of the most powerful and influential women in Anglo-Saxon England. It was on June 12, 918, that Aethelflaed ‘Lady of the Mercians’ took her last breath in Tamworth – the capital of the ancient kingdom of Mercia - before being finally laid to rest in St Oswald’s Priory in Gloucester, alongside her husband Aethelred. Daughter of King Alfred the Great, Aethelflaed is a key figure in the history and making of England. She ruled Mercia with her husband Aethelred (also known as Ethelred) and together they led the battle to defend the ancient kingdom against Viking invaders. Alongside Aethelflaed’s brother, Edward the Elder, the couple launched a series of military campaigns in the 10thcentury which brought large parts of England under Anglo-Saxon control. At the same time, Aethelflaed and Aethelred embarked on a major programme of building and fortification, creating defensive and strategic buhrs (fortified towns) throughout Mercia, and including Tamworth, a centre of royal power, where she spent much of her time in later life. After her husband’s death in 911, Aethelflaed became the sole ruler of Mercia and continued her campaign to further defend and expand her kingdom. She was a formidable warrior and was thought of as ‘queen’ by many of her subjects. She leaves a legacy as one of the most powerful female rulers of the time. by Philip Morgan, Keele University; Andrew Sargent, Keele University; Charles Insley,University of Manchester, and Morn Capper, University of Chester. The UK now has a female prime minister and Elizabeth II has been queen for more than six decades, but few would associate Anglo-Saxon England with powerful women. Nearly 1,100 years ago, however, Æthelflæd, “Lady of the Mercians”, died in Tamworth – as one of the most powerful political figures in tenth-century Britain. Although she has faded from English history, and is often seen as a bit-part player in the story of the making of England, Æthelflæd was in fact a hugely important figure before her death in 918, aged around 50. Indeed, the uncontested succession of her daughter, Ælfwynn, as Mercia’s leader was a move of successful female powerplay not matched until the coronation of Elizabeth I after the death of her half-sister Mary in 1558. So, while Bernard Cornwell’s novels and the BBC series The Last Kingdom are cavalier with the historical facts, perhaps they are right to give Æthelflæd a major role. Æthelflæd was born in the early 870s. Her father, Alfred “the Great” had become King of the West Saxons in 871, while her mother, Eahlswith, may have been from Mercian royal kindred. At the time, Anglo-Saxon “England” was made up of a series of smaller kingdoms, including Wessex in the south, Mercia in the Midlands and Northumbria in the far north. All faced encroachment by Viking forces that were growing in strength and ambition, as outlined in Charles Insley’s article The Strange End of the Mercian Kingdom and Mercia and the Making of England by Ian Walker. Æthelflæd spent most of her life in the Kingdom of Mercia married to its de facto ruler, Æthelred. Mercia had seen some dark days by the time of her marriage. In the eighth and early ninth centuries, the Mercian kings had had good cause to consider themselves the most powerful rulers in southern Britain. But by the 870s, the kingdom had suffered dramatically from the Viking assaults which had swept across England. One king, Burgred, had fled to Rome, and his successor, Ceolwulf II, was seen as a mere puppet by the West-Saxon compiler of the Anglo-Saxon Chronicle and disappeared between 878 and 883. Soon, the East Midlands were ruled by Scandinavians – what became known as the “Danelaw” – and so the kingdom ruled by Æthelflæd and Æthelred was by then just the western rump of the old Mercia. Nevertheless, Æthelflæd and Æthelred together engaged in massive rebuilding projects at Gloucester, Worcester, Stafford and Chester, overseeing the refounding of churches, new relic collections and saints’ cults. Famously, in 909, the relics of the seventh-century saint, Oswald were moved from Bardney, deep in Scandinavian-controlled Lincolnshire, to a new church at Gloucester. Perhaps appropriately, for a couple facing the Vikings, Æthelflæd and her husband had a great attachment to the saint, a warrior king and Christian martyr. Æthelred was buried alongside Oswald in 911, and Æthelflæd joined him seven years later. At the time, Athelred and Æthelflæd did not call themselves king or queen, nor do the official documents or coins refer to them as such. Instead, they used the title “Lord/Lady of the Mercians”, because Alfred had extended his authority over Mercia and styled himself “King of the Anglo-Saxons”. But they acted like rulers. 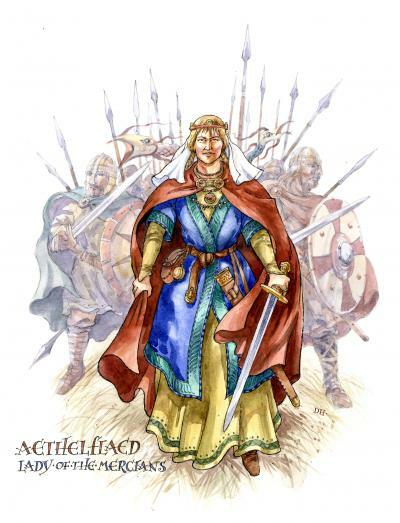 Æthelflæd, with her husband and her brother Edward the Elder, King of the Anglo-Saxons, launched a series of military campaigns in the early tenth century. These brought all of England south of the Humber and Mersey river under Anglo-Saxon control and rolled up the Scandinavian lordships which had been established in the East Midlands and East Anglia. These advances were backed up by an energetic programme of fortification, with burhs (fortified towns) built in places such as Bridgnorth, Runcorn, Chester and Manchester. But while she called herself a “lady”, outsiders, especially the Welsh and Irish, saw Æthelflæd as a “queen” and she surely wasn’t just her husband’s subservient wife. As Alfred the Great’s daughter, the role Mercia and the Mercians would play in the kingdom of the Anglo-Saxons was at stake. But Æthelflæd really came into her own following her husband’s death in 911, although it seems that he had been in poor health for the best part of the previous decade. The Mercian Register in the Anglo-Saxon Chronicle, certainly celebrates her deeds from 910 onwards. In 915, she successfully campaigned against the Welsh and the major Welsh kings, and in England she began further to expand her kingdom. In 917-8, her army took control of Viking-occupied Derby and Leicester, and just before her death, the “people of York” – that is, the Scandinavian lords of southern Northumbria – also agreed to submit to her. For a brief moment, she had authority not just over her own territory in Mercia, but over the Welsh, the Scandinavian East Midlands and possibly part of Northumbria, making her perhaps one of the three most important rulers in mainland Britain – the others being her brother Edward king of the Anglo-Saxons and Constantin II macAeda, King of the Scots. This made her a major political actor in her own right, but also a respected and feared figure. Even more remarkably, she passed her authority on to her daughter, Ælfwynn, who was around 30 when her mother died. The rule of Ælfwynn in Mercia, which attracts virtually no comment at all from historians, lasted about six months before her uncle Edward launched a coup d’état, deprived her of all authority and took her into Wessex." If you want to know what other academics have said about her then here is a summary bibliography.